Jerry Lewis Bryant, age 85, of Joplin, passed away on Tuesday September 18, 2018 at Joplin Gardens, following an illness. Jerry was born on May 17, 1933 in Joplin, the son of the late William Lewis and Katheryn (Wright) Bryant. He has been a resident of Joplin most of his life. He began working as a cab driver. He then worked many years as a bus mechanic for Joplin R-VII. He also worked as a bus aide. 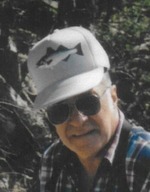 He enjoyed fishing and he loved watching NASCAR and sports on T.V. He married Ramona Ruth Mitchell on February 14, 1959. She preceded him in death on April 24, 2018. He was also preceded in death one son, Jerry Dellheim; one daughter, Marsha Bryant; one grandson, William Louie Owens, II; two brothers, Kenneth and Jimmy Bryant; and one sister, Mary Bryant Tucker. Jerry is survived by one son, Steve Bryant, Warsaw, Mo. ; one daughter, Jeannie Owens, Joplin; one sister, Kathy Bates, Joplin; one brother, Ricky Bryant, Seneca, Mo. ;three granddaughters, Billie Lawson, Crystal Martin, and Jeannifer Owens; and seven great-grandchildren, Marcus Martin, William Martin, Andrew Lawson, Olivia Lawson, Callie Martin, Christina Brandon, and Emma Lawson. Graveside services will be 2:00 p.m. Thursday at Ozark Memorial Park Cemetery. Randy Steele, Minister will officiate. The family will receive friends at 1:00 p.m. Thursday prior to the service at Mason-Woodard.